So, people may have genes that predispose them to a specific disease, but they would rarely develop the disease without the contribution of unhealthy lifestyles. Genes alone are almost never enough to cause any of the ten most deadly diseases. What the heck are Stanols and Sterols? If you are a "health junkie" like I have become, there are certain words and vocabulary that keep showing up. For me, I was noticing more and more mention of plant stanols and sterols. It turns out that they are really good for lowering our cholesterol. On a molecular level they act a lot like cholesterol so when they are traveling around in our body they get in the way of "real cholesterol" and prevent it from being absorbed in our bloodstream and ultimately clogging our arteries. Instead the cholesterol goes out with all other waste. According to an article I read on WebMD ( webmd.com ), just three servings a day of foods containing stanols or sterols can reduce cholesterol by 20 points. There are many foods, like butter and orange juice that are now fortified with stanols and sterols which makes it easy to fit into our daily diets. Other foods that are now fortified include cooking oils, salad dressings, milk, yogurt, snack bars, and juices. The main thing is to look on the labels to see which products include the stanols and sterols. An article on the Cleveland Clinic site actually lists products which have added stanols and sterols, Orowheat Whole Grain & Wheat Bread, for instance (clevelandclinic.org). The key is to fit them into your daily menu and calorie plan so you aren't over-eating just to add in the benefits they provide. That would be counter productive. A condition I often have to resist! A recent study from the University of California Davis Medical Center looked at the effects of sterol-fortified orange juice. Of 72 adults, half received regular orange juice and half the fortified OJ. After just two weeks, the people who drank the stanol-fortified juice had a 12.4% drop in their LDL cholesterol levels. The results were published in the journal Arteriosclerosis, Thrombosis, and Vascular Biology. This is a concrete example of why working stanols and sterols in our diets can be really beneficial. For those of us who would rather find stanols and sterols in foods that contain them naturally...phytosterols are naturally present in small quantities in vegetable oil, nuts, legumes, whole grains, fruits and vegetables. Evidently it is hard to consume enough stanols and sterols this way in order to have the level of effect needed to dramatically reduce cholesterol for those who have high cholesterol. Hence the development of stanols and sterols additives in other foods. More and more information is coming out about the health benefits of tea...and now, coffee. Both have been shown to help prevent cardiovascular disease as well as other diseases. I wanted to understand more about how such daily drinks can help us. Green and Black Teas contain polyphenols which are powerful antioxidants. As Drs. Flanigan and Sawyer point out in their book, Longevity Made Simple, antioxidants neutralize damaging effects of free radicals in our bodies. Free radicals damage our cells which can lead to cancer and cardiovascular disease. Herbal Teas do not have the same benefits. The best is Green Tea because it has been processed the least and therefore has the highest amount of antioxidants. Black Tea is still beneficial, it just contains about 10% less of antioxidants. Coffee also has high levels of antioxidants. In one study of postmenopausal women it was shown to reduce inflammation which then reduces the risk of cardiovascular diseases and other inflammatory diseases. Additionally, coffee has been shown to lower the risk of diabetes in both men and women. So, as it turns out, we receive health benefits from drinking tea and coffee. Drs. Flanigan and Sawyer recommend two cups of Green or Black Tea each day. And for coffee, they recommend no more than four 8 ounce cups per day. I can live with that! When I was a local Executive Director of the American Heart Association I had the great honor of working with some amazing doctors and researchers who were dedicated to helping people live healthier lives. One of the doctors I got to know well was Richard Flanigan, MD. He is an accomplished cardiologist who recently wrote a book with his equally accomplished daughter, Kate Flanigan Sawyer, MD, MPH. 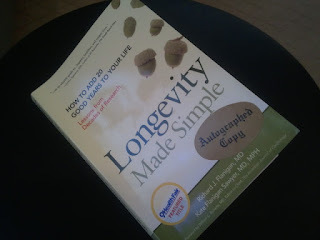 Their book is Longevity Made Simple (http://www.longevitymadesimple.com/). It is a book I have so enjoyed reading. Longevity Made Simple is a very approachable book about a very complex subject. It is written in "plain English" and is also only 168 pages, so very readable. I also like the way the information is broken down and presented in the book. The basic premise is to help the reader understand the 10 Leading Causes of Death, their risk factors, preventative lifestyle behaviors that can be adopted and the resources & ideas that can help us manage our risk factors in order to live healthier, longer lives. This book makes you believe it is possible....with a little dedication and work! ...your health is up to you. You decide what you put in your mouth, what you do with your body, or what screening tests you get. What we are telling you here is that those choices make a real difference. The right choices can add years to your life, while the wrong ones can not only take away years to your life, but also make those final years low quality ones filled with disease and disability. I definitely recommend this book. It is a compact resource book filled with important information, why it is relevant to each of us and how we can take steps, given our specific risk factors, to live healthier, longer lives. 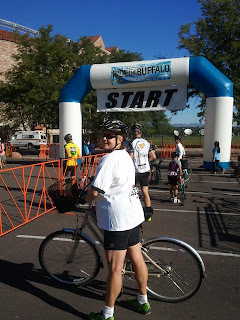 This past weekend my husband and I did a 17 mile bike ride on Saturday. My husband loves to bicycle. It is easy on his knees and is much more pleasant for him than a formal work out at the "Y". If you had asked me just a couple of years ago if I would choose a long bike ride or a work out, I would have chosen the work out. Cycling was definitely harder for me, mainly becasue of stamina. But to be with my husband and to vary the routine, I have embraced cycling and I am getting better and better at it. The reality is that to permanently embrace a healthy lifestyle you have to integrate healthy activity into your everyday life and make sure it is a "family affair". My husband likes to bike ride and now I do too. My daughter gave me the amazing Mother's Day gift of working out at the "Y" with me a few times a week...which we are still doing. And as a family, we participate in organized charity walks, rolls and rides. This past weekend my husband, daughter and I spent Sunday morning participating in a 5K Walk for the NSCD...an amazing organization that provides adaptive sports for those who are differently-abled. It was a beautiful morning with the sun shining and warm weather. We marched alongside 5000 other people. 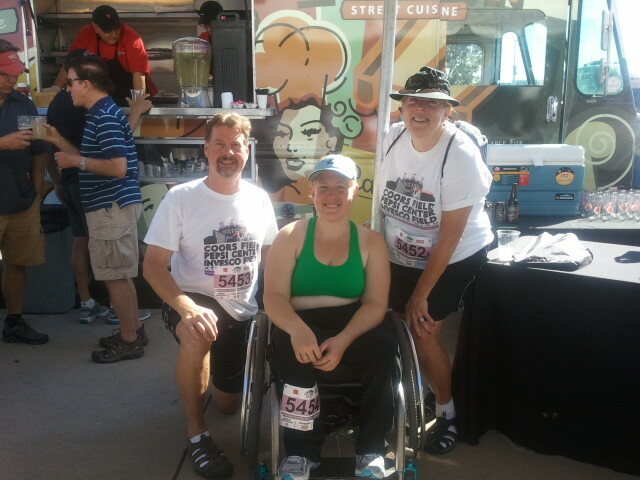 It was such a fun thing to do for a great cause and with my family...and healthy! In the "former life" the only thing I would have wanted to do on a Sunday morning was sleep in or go out to brunch after church. Who would ever have imagined that I would relish a 5K at age 55 on a Sunday morning! Certainly not the "old me". Sometimes I feel that I need to pinch myself...can this new mode really be a part of me? It feels good, I want to keep doing it...so I guess it really is "me"! I have been creating weekly menus for years. Having been a working mom with lots of volunteer activities and very busy kids, taboot, I learned early on to be efficient in designing meals and making grocery lists. My goal was to get it all organized and go to the grocery store once a week, on Sundays. It has worked well. I never took the time to create a template but always drew lines on a pad of paper, creating a new menu grid for each week. The recipes would be noted and on what page. Now I have added the calories for each serving. Thanks to my husband, he took my updated hand-drawn template and made it into an excel spreadsheet. I love it! I uploaded it as one of my pages on my blog so others can copy it and use it. This has simplified my life already. I no longer have to take the time to hand-draw each weekly menu grid. I also went out and bought a 3-ring notebook and 3-hole punched copying paper. Now I don't have to manage multiple pads with old menus. And I will never need to hand-draw a weekly menu again! Now I can review and choose a whole weekly menu, once I have built up a portfolio of them, put any one of them at the top of my Menu Notebook and re-use it whenever I like! For those really busy weeks I can pick a weekly menu and just create a grocery list for that week. I can't wait to see how much time that will save me. In "the old days" I would re-copy menus by hand, over and over again. It was a tedious task and laborious. My husband also gave me the great idea to put a 3-hole plastic sheet protector at the front of the notebook to help protect the current week's menu from my cook's fingers when I am busy preparing a meal. The menus will last much longer that way. Not only does organizing menus save me overall time and money but it also helps me design balanced meals in a weekly context...and best of all, it helps me keep track of my calories. More and more there are cookbooks out there that plan a meal for you with the calories outlined which makes menu planning really easy. But we all have our old favorite recipes which then need to be made into a meal. The only way I know how to make sure I am honest about amounts of food and calories is to use recipes and keep track of the calories for each recipe. A meal should not be over 500 calories so my goal for each menu is to create a balanced meal for less than that. I am creating tasty meals and sticking to the calorie goal. It really is possible. If anyone uses another technique that is working, I would love to hear about it and share it. Also, if anyone takes on using my template, I would love to hear about that too...the easier we can make it the more possible it is for us to succeed! There is an interesting article in the October edition of Men's Health regarding a rising concern about our decreasing use of salt, most specifically, iodized salt. Turns out that iodine is critical for the proper functioning of our thyroid gland. Our thyroid gland is often described as the thermostat of the human endocrine system. It regulates your body's use of energy, and creates and stores hormones that control everything from your metabolism to your growth rate. Our intake of iodine has decreased by half in the past 25 years. 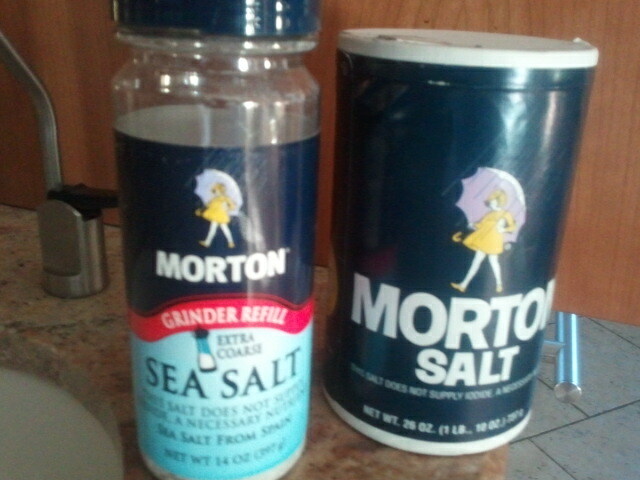 The main source for our iodine intake is iodized salt. What is interesting is that most of our intake of salt is through the prepared food in restaurants and that salt is not iodized. So we may still have too much salt in our diets but not enough iodine. One solution, which many of us are striving for, is to cook more at home so we can control our salt (and calorie) intake and now, our iodine intake. Another, perhaps easier solution, is to take a multivitamin, according to Angela Leung, MD. A multivitamin supplies the proper daily dose of iodine-- 150 micrograms (mcg)-- and also contains other thyroid-supporting nutrients like selenium. Iodine is one of those substances that can have deleterious effects if you take in too much. The main thing is to make sure you are taking care of the daily dose. Since our thyroid regulates our metabolism, a pinch of iodized salt...or our daily multivitamin can go a long way towards helping us stay healthy and better manage our weight. Amazing Chocolate Chip Cookies and ONLY 88 Calories! 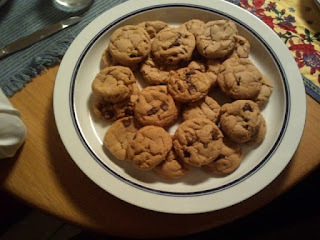 The picture above was taken this last weekend after I baked these delicious chocolate chip cookies! I found this wonderful new recipe for Chocolate Chip Cookies in the Mix & Match Low Calorie Cookbook from Cooking Light I recently purchased. There is nothing better than a tasty home made chocolate chip cookie. They are much like vanilla ice cream...a favorite for many. They inevitably bring back sweet memories of our childhood. The amazing thing about these cookies is that they end up being only 88 calories for a boat-load of flavor in a reasonably sized cookie. It is so good, I wanted to share it with you. I actually found it on line which makes it even easier to share. You can find it at http://www.myrecipes.com/recipe/chocolate-chip-cookies. Hope you enjoy them as much as we did! I have been reading more and more about the benefits of flaxseed. It is a great source of fiber and also of omega-3 fatty acids...both key ingredients for staying healthy. Ground flaxseed can be springled over cereal, cottage cheese, yogurt, or put in your morning smoothies, like I do. In fact, there is no limitation to what you can springle flaxseed on, just your imagination. This is such an easy method to gain fiber and stay on top of your omega-3 fatty acid in take. It is a no brainer. And it also does not have a bad taste! "You're going to eat a few times a day for the rest of your life, so you may as well enjoy it!" You may have seen my blog on how our family was watching too much TV. One of the things I realized was that we had substituted watching television for being involved in a hobby. I sat down to think about what I do that would constitute a hobby and what I once did or might like to learn that could be added to the list. My range of interests is broad. I like to read and cook; I like to draw pictures, write poetry and listen to music; I also like to hike, snowshoe, workout at the "Y" and bicycle with my husband. Going to lectures in the evening is also fun. My issue, it seems, is not a lack of interests but more the challenge of incorporating them into my evenings. My next goal is to incorporate fun activities, including playing games with family, into my evenings each week. How can Hobbies help with your health? Having hobbies can help you keep busy so you are not overeating, they can lower your blood pressure, provide a release from stress, and keep your mind and body active. Want to quit smoking or drinking? Want to feel more interested in life, a sense of accomplishment? Find some Hobbies. Your hobbies will be unique to you; find things you are good at, you have always wanted to learn, or bring back something you did years ago. They can range anywhere from: crafts, games, art, music, writing, pets, gardening, and exercise. Animals are also important to health. Taking care of and bonding with them, requires learning, activity and opening yourself up to love. Animals have been known to lower blood pressure, provide laughter and to even help people with disabilities open up. Laughter has been shown to provide many health benefits, such as: lowering blood pressure, helping digestion and keeping you young. Art and music and writing have been used for therapy; it has been shown that developing our creative side is so valuable for overall health. Singing requires one to breath deeply, bringing more oxygen into the lungs and cells of the body. Writing allows us to express our feelings and creativity. Art, allows us to de-stress and to express ourselves; all three provide a sense of accomplishment (Hobbies & Health). The challenge is on...for all the right reasons...so now to start exploring and fitting the fun in at night! There are so many moments of transition in our lives. Menopause is a big one for women. I always wondered what it would be like. Now that I am officially menopausal, I can be one of the ones to "show the way". Honestly, I have never felt better. The burden of the monthly menstrual cycle is lifted. With it have also gone the mood swings and discomfort. And even though I have been married for nearly 30 years, have 3 amazing, wonderful kids, it is nice to know, definitively, I don't have to worry about getting pregnant anymore! I have no desire to find out what that would be like at the age of 55! All this adds up to being emotionally freeing. Emotional Well-Being: After menopause, you may find yourself experiencing new levels of satisfaction in your life. In a recent study, more than 75% of women reported that they were having more fun in their everyday lives, and 93% reported an increase in their independence. Menopause can be a time when new doors open up for you. You may find yourself having the freedom to explore new job options, travel, or leisure activities. Many women also find that they have time for greater self-exploration. It is much easier to be 55 than it is to be 45. What I have discovered is that being perimenopausal was much harder on me. That is when I got the hot flashes, when my menstrual cycles were so heavy they were nearly impossible to manage and when sleep truly became a precious commodity. It is relieving to look back now and realize that period was only a phase. A phase I lived through and mercifully can look back on, knowing I am in so much better shape and don't have to live with those symptoms any more. Because of all the symptoms, particularly the heavy bleeding, it was recommended to me more than once that I consider a hysterectomy. My question back was "is there any health issue that warrants such a significant surgery?" The answer was always "Well, no...it is a lifestyle issue...is it manageable in your everyday life?" I seriously thought about that becasue I did have to endure some unfortunate and embarrassing moments related to being perimenopausal. But then I would think about the additional effects and consequences I would be adding to the list if I chose the hysterectomy route. And I reminded myself that it would end, this was not a forever proposition. This is a natural stage of life, afterall. There really is nothing wrong with us...just different. I am glad to say The Misery has ended. Other than the reality of typical aging, I am in great shape. Menopause, yes, menopause, feels good! It seems we are always pushing our selves to do things. I think it is what keeps us alive and kicking. It is sort of like that old business dictum "If you are not growing, you are dying". I think our lives are like that too. If we don't keep learning and trying new things, we start the slow downward spiral, with our minds and body atrophying. Tough stuff, but true. And now that I have reached the ripening age of 55, I recognize how easy it is to let go of what is truly a quality of life by not continually challenging myself. The memory gets rusty, the muscles get cranky, the voice gets froggy and the smile droops downward, along with other parts of the body we won't mention. The scariest part of the ride was the start. With everyone starting at once there is a crunch of people and bikes. This was particularly challenging because it also included children on their bikes. People are looking out for themselves and aren't so aware of others around them which can make for some perilous moments. My best strategy was to not push it and keep some distance between me and those in front of me. I was especially cautious at the beginning...and asked my husband, who is a much better cyclist, to look out for me, running interference with the more aggressive cyclists eager to cut in front of me. It worked out well. I am looking forward to my next ride. My mom used to always hide tin of cookies or brownies in secret locations throughout the house when I was growing up. We were strictly forbidden to find or eat those goodies. It was a while before I understood that she wasn't hiding them from me or my siblings...her kids...but instead was hiding them from herself. We, of course, thought it was a great game. We loved finding and secretly consuming the forbidden delights. Sometimes we would find tins that had been long forgotten so the sweets were mummified and inedible. 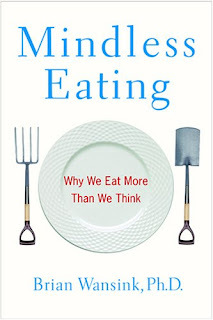 Dr. Brian Wansink in his book, Mindless Eating, talks about benefits from putting food, like sweets, out of sight or inconveniently located to make it more difficult for us to get them and eat them. 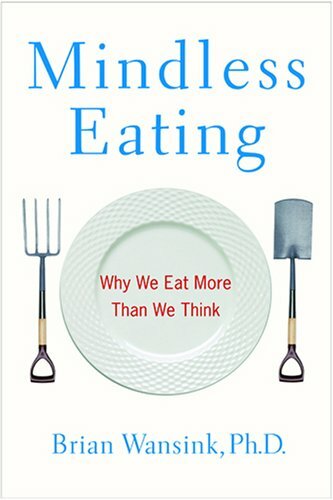 He sites research that shows that the more effort it takes for us to find and reach a food, the less frequently we are likely to go for it. This is particularly true for those who are obese. So the lesson here is that my beautiful and svelte mom was on to something-- anything you don't want to consume all the time and that is not "good for you", place in an out of the way place and/or out of sight. My new "out of sight" method is to bake my muffins, cookies & brownies, then individually wrap them and put them in my freezer. That way I can't just grab and eat it. There is a thawing process that has to occur first. I am also just accessing one sweet or goodie at a time...no more whole tins of sweets sitting on the counter calling my name every time I pass by. I also like the idea of storing my baked goods in the freezer because they last longer. I am not falsely compelled to eat more than I should because the food will be "wasted" or "go bad"...a cardinal sin in my family. It appeals to my frugal side of "waste not, want not". A tactic that relieves the internal conflicts and eliminates time honored excuses. Once I started working out in earnest each day, my muscles got tricky to release. One muscle in particular on my thigh got locked, was sore all the time, and made it hard to climb up stairs because it didn't want to bear weight. I did lots of stretches which helped, but it didn't release or relax that locked muscle. My massage therapist recommended trying Bath Salts, the most common being Epsom Salts. It worked! 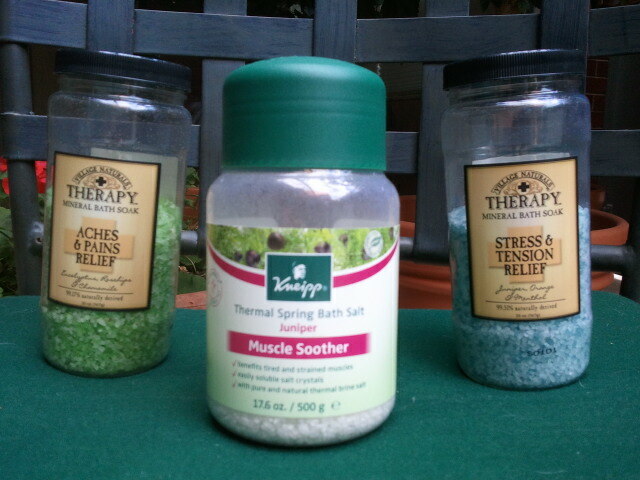 And since I continue to strain and stress my muscles, using bath salts has become a regular part of my routine. It is so easy to use and the most affordable muscle reliever out there. There are many different varieties out there and at all price points. Buying Epsom Salts at the grocery store is by far the most economical. The most expensive I found was some bath salts I bought at a spa made by Kneipp. I really liked it for its aroma from added essential oils and also for the way it completely dissolved in the bath tub. I couldn't find it on line to buy and I bought it out of town, which was probably a good thing, because it forced me to do some more research to find something similar. First I tried Burt's Bees Bath Salts. It is very affordable but also very strong. Too strong for me. 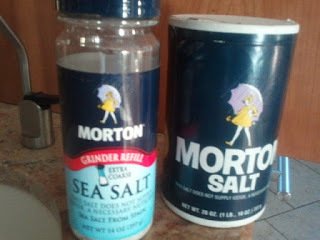 The salts are large and don't tend to completely dissolve. It actually stung my skin. ore recently I have tried a couple of versions from Village Naturals. I like both the Aches & Pains Relief as well as the Stress & Tension Relief. Each has a number of essential oils added and a unique appealing aroma. They are an even better buy than the Burt's Bees. We have a Jacuzzi bath tub so it is important the salts don't foam. The Village Naturals do not. All of these you can order on line through Amazon.com as well as Drugstore.com which can be even more economical than buying them at places like Whole Foods since there is no tax and often free shipping! After a long day there is nothing more relaxing than soaking in a bath tub with aromatic bath salts. We tried out another salad from Rocco Dispirito's Now Eat This! cookbook. 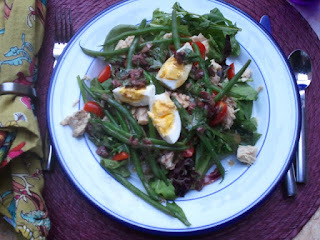 This time we tried the Nicoise Salad on page 62. I was impressed. It was full of flavor and lots of goodies. The one thing I am used to in a Niciose are quartered potatoes. He eliminated that ingredient altogether. He also made it a healthier version by taking out the yoke of the egg ( I was lazy and kept ours in this round), adding more greens and making the dressing lighter. It was amazingly hearty for only 193 calories. To make it a meal we added a 2 oz slice of French Baguette (130 cal) and a slice of a summer melon (53 cal). It was easy to make which was an added plus on a hot summer night. A repeat! Where we live I am surrounded by sagebrush. People for years have told me about the benefits of sage. I know I love the smell of it as we brush up against it as we hike, releasing its unique fragrance. Many cultures, including Native American, ascribe to the cleansing benefits of sage. With my journey to a Healthier Lifestyle, I thought it was worth researching. The first thing I found out is that the sage we use as a seasoning is a saliva plant. The sagebrush we see all around us on mountainsides and in other arid climates is different. It is called Artemisia Tridentata and is not suitable in cooking. It is great for making smudge sticks, however. This use of sage springs from at least two powerful spiritual ancient sources, who, so far as is known, evolved independently from each other: the ancient Celts, including the Druids, and the Native Americans. The Druids and ancient Celts used sage to increase wisdom and knowledge, and for protection and healing. Sage is used in this tradition not only for the cleansing powers of its smoke but for tea as well. In the Native American traditions, sage (also called “sukodawabuk”) is a sacred element in many rituals. For example, the Ojibwa tribe used sage as an anti-convulsant, to staunch bleeding, and as a stimulant. The Potawatomis used sage both as a purifying smoke smudge and as a poultice for festering sores and wounds. Sage also has been used in Native American sweat cleansing rituals with the scattering of sage on the floor of the sweat lodge. All of us at different times in our lives want to "start over" or "begin anew"; we want to refresh ourselves and our environment so we can embrace the present as well as the future. Big events in our lives often force us to re-evaluate our lives or make us long for a fresh start. Cleansing rituals can support us in this process. 1. Buy a sage smudge stick (or you can make your own) and find a bowl to hold it over (traditionally, abalone shell is used). Also set up a cup of water to extinguish it after the ritual. Ritual is such an important part of our lives. It helps acknowledge big moments in our lives and provides the vehicle for us to move from the old to the new. I was surprised when I started talking about Smudge sticks how many people have used them, some as a regular part of their daily lives. I was also surprised to see how readily available they are...from the local Farmer's Market to Whole Foods. 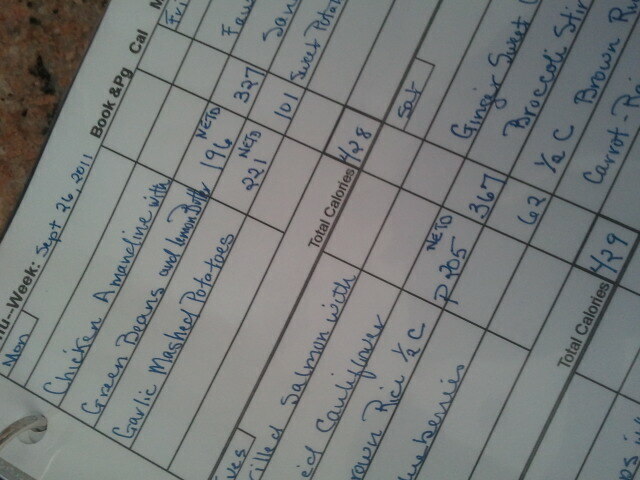 Clearly many are way ahead of me! What has appealed to me is making my own Smudge Sticks. 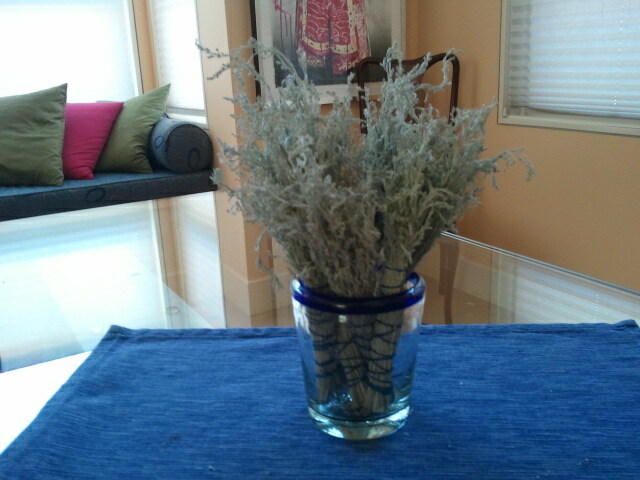 The photo you see at the top of my blog is of the very first smudge sticks I made from harvesting local sagebrush. Just binding bunches and putting them in a basket in my home is refreshing. They are beautiful to look at and do provide a cleansing aroma. I have since found out that I need to bind the bunches tighter and cut off the ends to make a proper Smudge Stick. You need a stick that will smolder, not flame and send embers floating in the air! I am looking forward to perfecting my version of the Smudge Stick and sharing them with friends and family. I find nothing more enjoyable than sharing new found knowledge and something I have handmade. If something can be helpful, why not share?